The Scottish Premiership fixture has been called off after two pitch inspections. Hamilton Accies' Scottish Premiership fixture at home to Kilmarnock on Wednesday evening has been postponed. New Douglas Park was subject to two pitch inspections just hours before the 7.45 kick off but was deemed unfit to host the game. 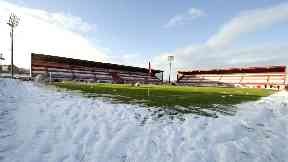 Snow and icy weather across South Lanarkshire over the Christmas period led to referee Barry Cook deciding not to play the game on the plastic pitch. Accies were looking to close the five-point gap on Kilmarnock and move closer to the top six ahead of the winter break next week. Steve Clarke's Kilmarnock are on a run of five games without defeat and now take on Hibs at Easter Road on Saturday. Next up for Accies is a trip to Motherwell at the weekend for the Lanarkshire derby.